The Maplewood neighborhood extends from Driving Park Avenue to the south end of Holy Sepulchre Cemetery and from the Genesee River on the east to the Rochester City Line on the west. For Rochester's sesquicentennial in 1984 neighborhood groups were asked to write a local history. A very helpful Maplewood history was researched and written by Lorna and Sharon Logan. 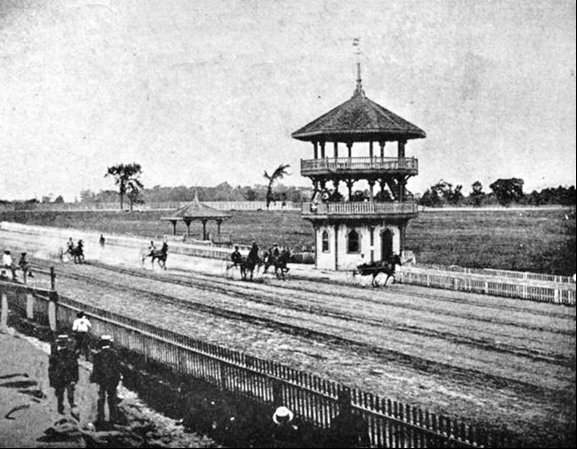 Stages in the growth of Maplewood were King's Landing (1797), McCrackenville (1826), Ellwanger, Barry activity (1868) and the opening of Kodak Park (1891). 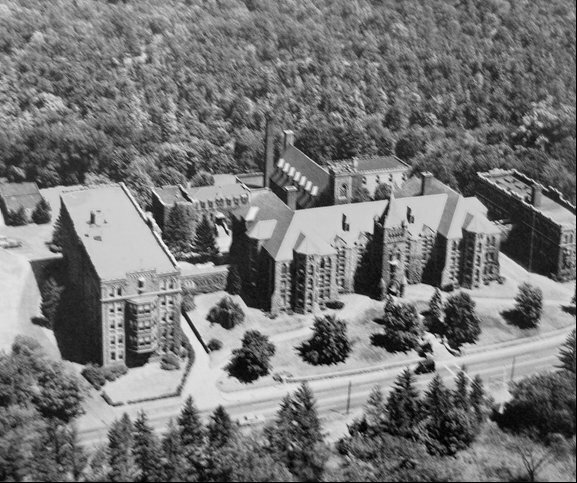 Whatever Happened To St. Bernard's Seminary? When Elizabeth Hamilton Fish, whose husband was running Ebenezer Allen's grist mill near the present Main Street bridge, passed away in March 1798 Gideon King selected a site for her burial. 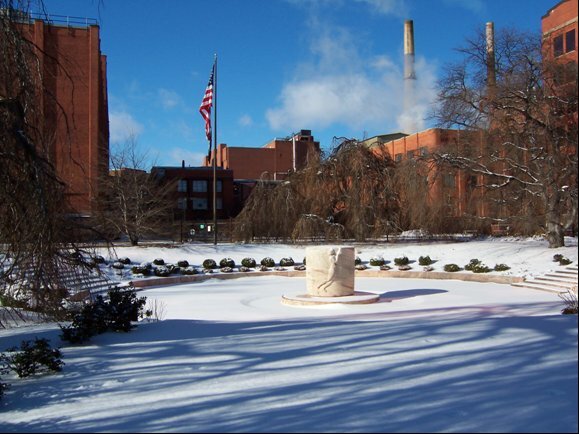 Later in the year, with the arrival of warmer weather and the "genesee fever", Gideon King, his son Bildad and his wife's brother Daniel Graham passed away and this site became Rochester's first cemetery. 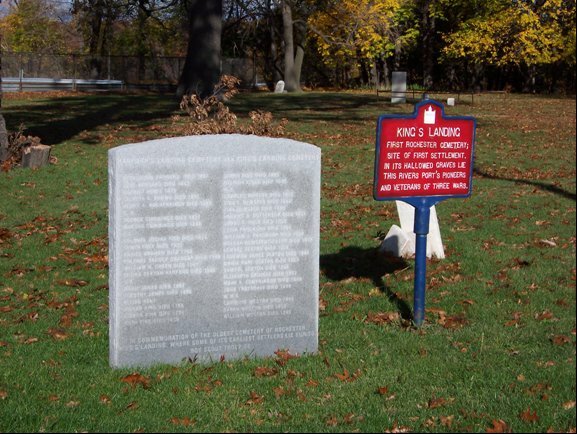 King's Landing was the first settlement in the Rochester area on the west side of the Genesee River. Note that the settlement was on the SE corner of Lake Ave. and Landing Road. The landing was on the river where the water treatment plant is now located. Dr. Rush Rhees, President of the University of Rochester, speaking on September 15, 1934 at the dedication of the Eastman Memorial. 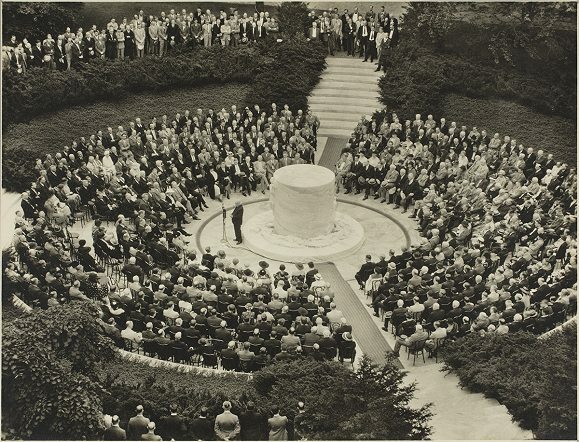 The ceremony was attended by local officials, Kodak executives and employees and representatives of the many Rochester organizations Mr. Eastman had helped build. It was broadcast on local radio stations. The tradition of presenting employees a bronze medal with a profile of Mr. Eastman after twenty five years of employment was announced here. 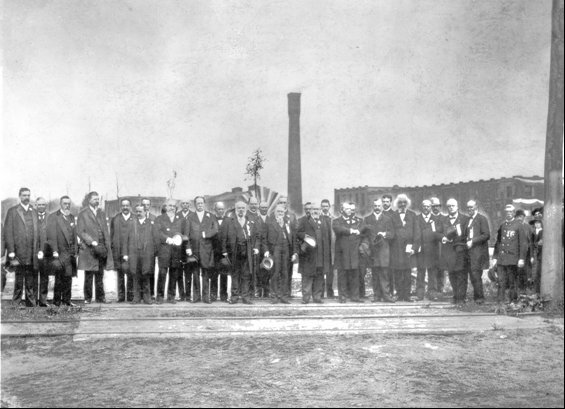 Not related to the memorial, but this picture of dignitaries in town for the Memorial Day 1892 dedication of the Soldiers and Sailors Monument in Washington Square Park, is of interest. They rose early and took a streetcar to Charlotte for breakfast at the Cottage Hotel. The Charlotte line was one of the first electrified street cars in the country. On the way they stopped at the Kodak plant to have a photograph taken. George Eastman is not pictured but President Benjamin Harrison is near the center and Frederick Douglass on the right. It is said there was signage that said Kodak Park, the first official use of that name. 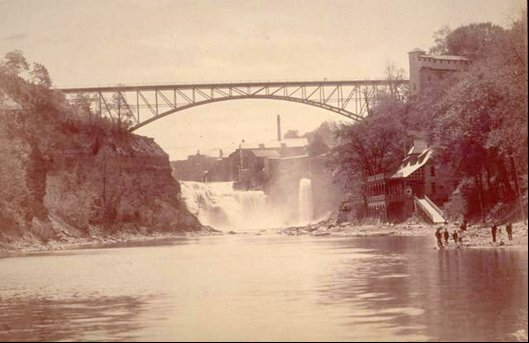 Rochester had a problem with water from the storm sewer over flowing into the sanitary sewer and subsequently into the Genesee River. To correct this, a tunnel system was built in the 1980's. To bring the sewage from the west side across the river and then to the Van Lare treatment plant, two large pipes crossed the Genesee just north of the Veterans Memorial Bridge. 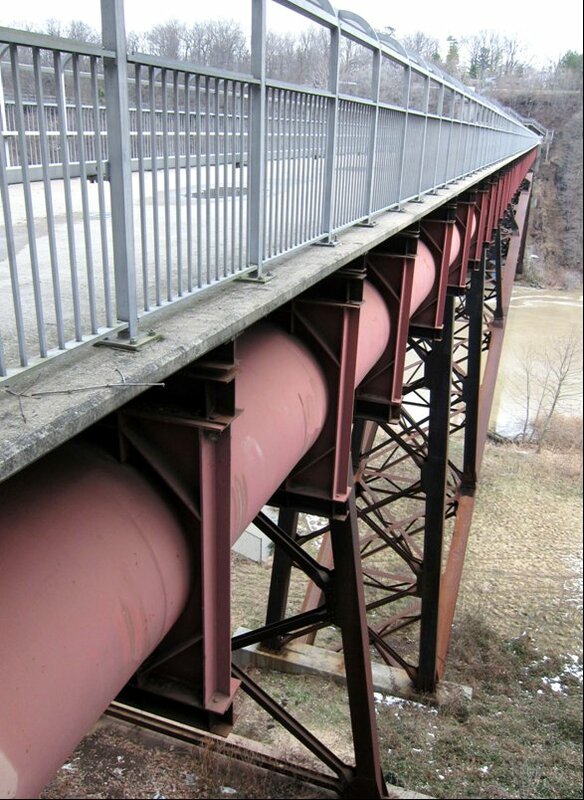 A walkway was built over the pipes to provide a convenient way for walkers, runners and bikers to cross the river. The walkway opened in 1989 and is now part of the Genesee Riverway Trail System. 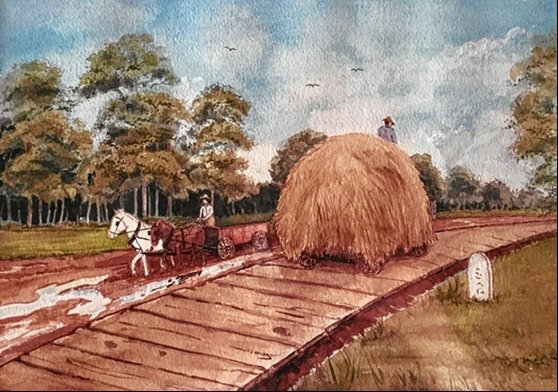 The above painting is from the collection of the Plank Road Historical Village in Toll Road Park in North Syracuse, New York. Promoted by George Geddes, son of James Geddes, of Erie Canal fame, the middle 1800's were a boom period for building plank roads. Central NY was the center of the wooden roads boom in the US - until they rotted. The first plank road went from Syracuse to Central Square. The Rochester - Charlotte plank road company was organized in March 1849 and had completed a road from the present Driving Park Avenue to Charlotte, along Lake Avenue, by the fall of 1849. There were often complaints regarding plank road maintenance. The following newspaper articles were transcribed by Jack Kemp. Several plank roads were built in the area at that time. This map is from an 1875 plat map. The street on the east named Boulevard is now Dewey Avenue and that on the south is Driving Park Avenue. 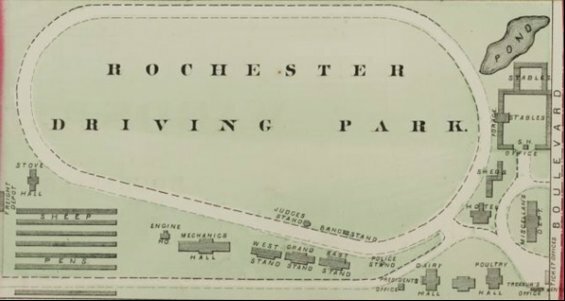 Rochester Driving Park area in the late 1800's. View of the home stretch, Rochester Driving Park. The YMCA built its first major building in 1890 at the NE corner of South St. Paul Street, now South Avenue, and Court Street. Its shifting emphasis on evangelism and social welfare and the growth in the immigrant population led to the need for a new building suited to changing times. The idea was to build a major central building and some suitable branches. 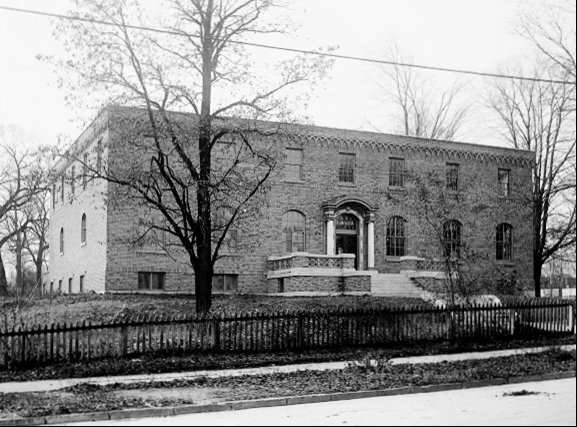 Limited finances led to the opening of the Gibbs Street Y and only one branch Y, Maplewood in 1916. The opening ceremonies for the Gibbs Street Y were held March 26 to 29 and for the Maplewood branch November 14 and 15, 1916. 1916 - Maplewood YMCA nearing completion . 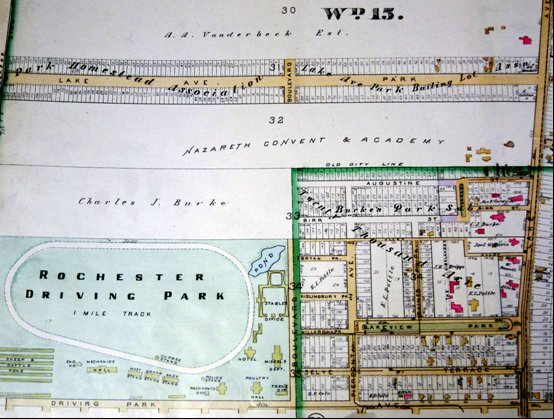 When the Rochester Park System began, several landscape architects were asked to submit plans. The plan of Frederick Law Olmsted was accepted. He suggested two parks, South Park and North Park, both on the Genesee River. 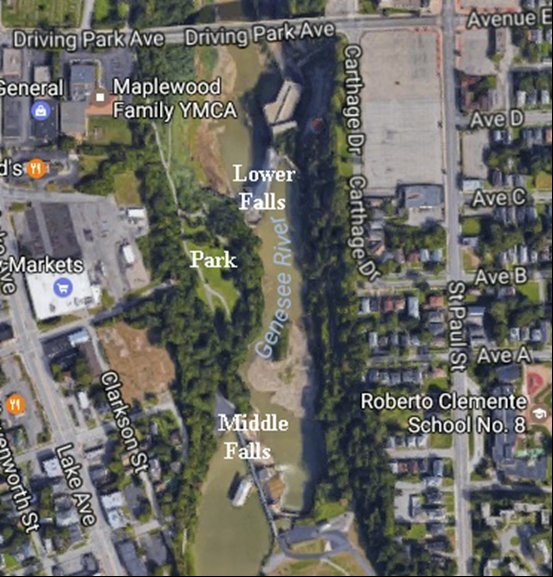 South Park would highlight meadows and rolling hills while North Park would feature the Lower Gorge of the Genesee River. South Park became Genesee Valley Park and North Park, on both sides of the river, was Seneca Park. Like all cities at the time Rochester was deciding what to do with human waste and like most cities decided to dump it in the local river. 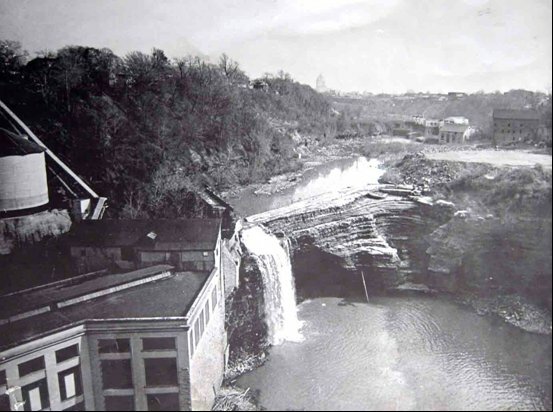 Rochester's first major sewer, the Eastside Trunk Sewer, emptied into the Genesee River near the Lower Falls not far above the Glen House. Ellwanger, Barry and their partners sued and the City agreed to buy their Maple Grove and Glen House properties. The firm Olmsted Sons designed a park for this land. 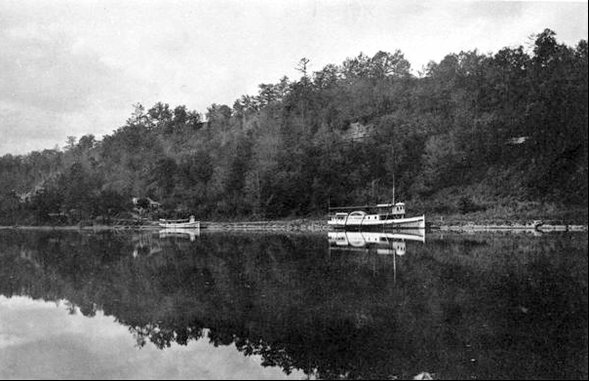 When the park was dedicated in 1904 and added to the park system, the park on the east bank remained Seneca Park and that on the west became Maplewood Park. In 1988, to commemorate the 100th anniversary of the founding of the park system, Dr.Blake McKelvey wrote a book, A Growing Legacy: an illustrated history of Rochester's parks. This link below will take you to information from that publication on the founding and early days of the park system. Elsa Von Blumen was the professional name of Caroline Kiner, a race walker and bicycle racer. She was Rochester's first well known female professional athlete. Elsa was involved in two major events to raise money for the Soldiers and Sailor's Civil War Monument located in Washington Square Park. The first was a bicycle race against two men held at the New York State Arsenal, now Geva Theater. The program states her advocacy for women's physical fitness. 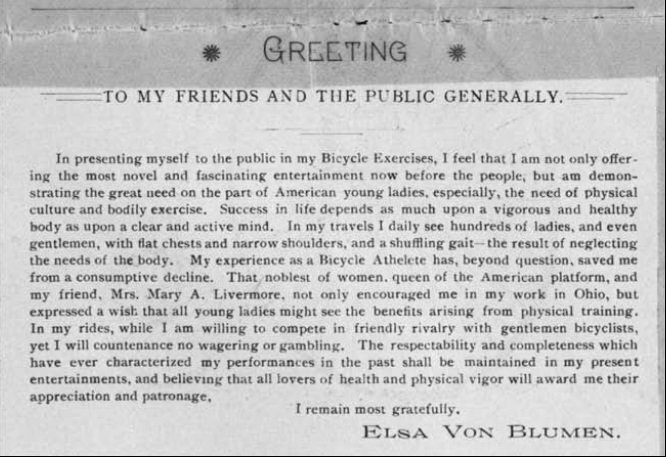 "In presenting myself to the public in my Bicycle Exercises, I feel that I am not only offering the most novel and fascinating entertainment now before the people, but am demonstrating the great need on the part of American young ladies, especially, the need of physical culture and bodily exercise. Success in life depends as much upon a vigorous and healthy body as a clear and active mind." More recent local sources say she won the race but articles from the time tell a different story. Elsa rode 367 miles and one lap in 38 hours and 58 minutes. The men rode 369 miles in 38 hours and 14 minutes. 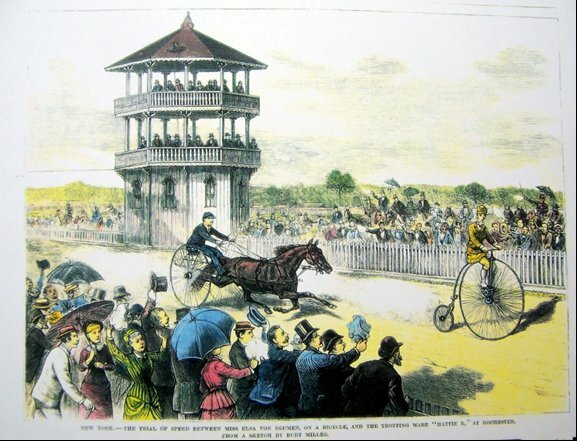 The second event was a handicapped race against two horses. Elsa rode one mile while the horses ran 1 1/2 miles. 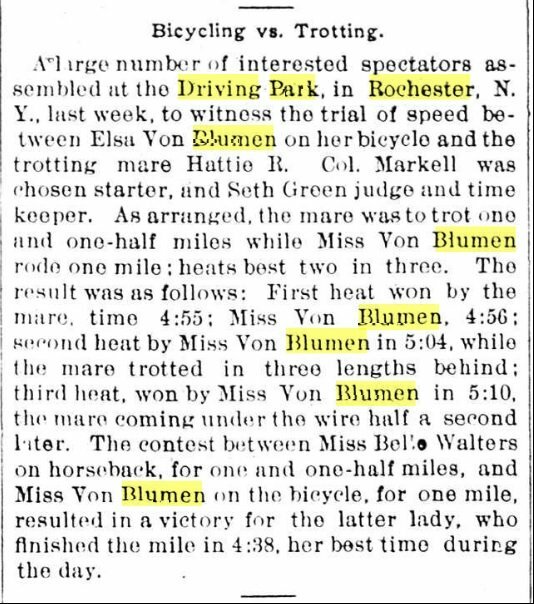 An article from the National Police Gazette from June 11, 1881 gives the results. The Balestiers lived on the NW corner of Thorne St and Rowe (now Lexington) Avenue. There were two boys and two daughters. Wolcott and Caroline are the center of this story. Wolcott attended Cornell and Caroline would visit him. They were known for being showy. If wide hat brims were in style they had the widest brims and if stripes were in fashion they had the widest stripes. Wolcott left Cornell, worked for a short time for a Rochester newspaper, eventually getting a job in London acquiring the rights to books not yet printed in the US. His mother and sister went to London to help him set up an office. In London he became friends with a British author and they co-wrote a book, The Naulahka. Balestier's part took place in Colorado and the British writer's in India. It was the only time the British writer had a co-author. Wolcott fell ill with typhoid fever. His mother and sister took him to Dresden hoping he would get better. He got worse and his family asked the British author to come to his bedside. His deathbed wish was 'marry my sister' which the British author did eight weeks later. Who was the British author? In 1907 he became the first person writing in English to win the Nobel prize. This account is loosely based on the facts. A web search for Caroline Balestier will lead to several interesting articles. 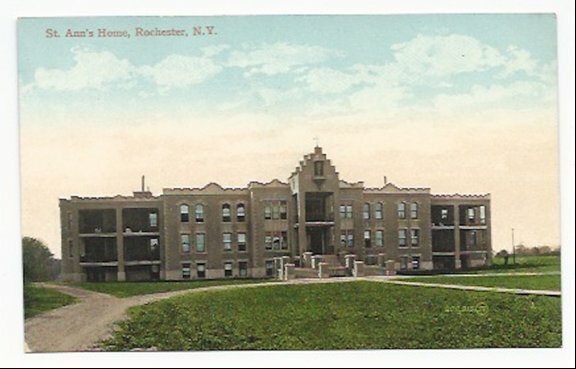 The link below from the Rochester Subway web site describes the Glen House, a resort built on the Genesee River by Ellwanger, Barry and others. Ellwanger and Barry were transitioning from a horticultural company to a real estate company. The horticultural business closed in 1918 and the real estate business was liquidated in 1963.They had purchased property in what is now the Maplewood area. They started Rochester's first public transportation system, the horse car, to make their property in the Mt. Hope and Maplewood areas accessible. To attract people to the Maplewood area they opened a picnic area, the Maple Grove, ca. 1868 and added the Glen House, a resort on the Genesee River in 1870. Initially one had to walk down to the Glen House and then negotiate an approximately 170 foot climb to return to the Maple Grove level. An elevator was added in 1878. The nearby Driving Park Bridge opened in 1890. These dates help date Glen House pictures. The Rochester Subway website has photographs of the facility. Clicking on a picture will give a slightly larger labeled version. With no bridge across the Genesee north of the Upper Falls there was much competition between the NE and NW sections of Rochester. Gardner McCracken, among others, complained that the NE side was favored. They had a boat landing, the former Carthage Landing and the NW side had none. In the early 1840's the Common Council agreed to the building of Buell Avenue. It would start at the NW side of McCracken Street at the Genesee River and run along the high bank eventually descending, on excavated areas and embankments behind stone walls, to a boat landing on the Genesee River, just south of the present Veterans Memorial Bridge. The road was very controversial and may never have been accepted as completed by the Common Council. Some examples of the newspaper articles published at the time are here. 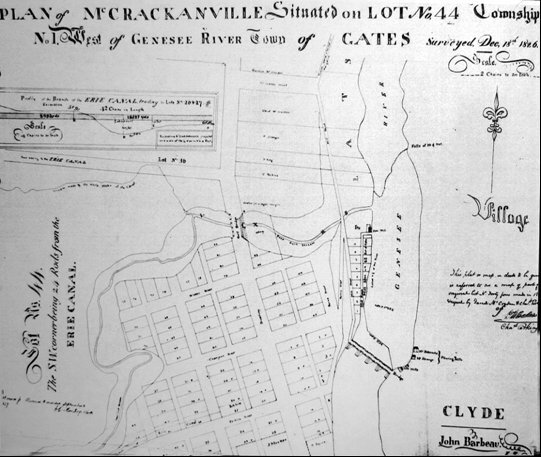 When Alexander Kelsey purchased the rights to the landing on the east side of the Genesee more arguing ensued. The Rochester Historical Society, Publication Fund Series Volume II, 1928, Page 215. "The promoters of Kelsey's Landing on the west side, where some freight was shipped and considerable boat building was done had for years, coveted the thriving business done at Carthage Landing. The roads on both sides of the river were execrable and a scheme was put through the council to improve Buell Avenue by cutting out a road through the rock. A large warehouse was built at the dock with a modern grain elevator; also an hotel and a line of omnibuses ran from the city to the dock. Carthage had indeed met her Waterloo. The new landing took all the steamboat business and most of the freight, retaining it until the New York Central railroad to Charlotte was built." Looking south Buell Avenue from a Fred Eales stereoview - note the Lower Falls in the center and some McCrackenville buildings in the right center. 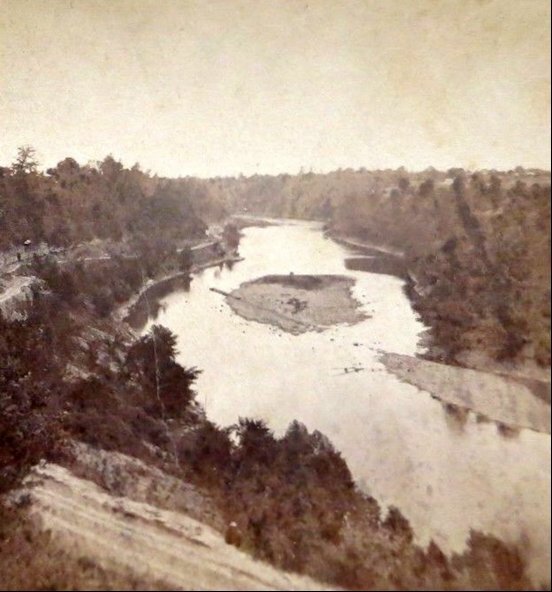 Looking north down the river from a Fred Eales stereoview - note Buell Avenue running along the left edge of the picture down to Kelsey's Landing - Seth Green Island is in the middle of the picture. On a 10/10/2016 walk in the gorge the wall section above was the only obvious part of Buell Avenue found. The route of Buell Avenue and the location of Kelsey's Landing were not obvious. After the War of 1812 ended three McCracken brothers moved to Rochester from Batavia. 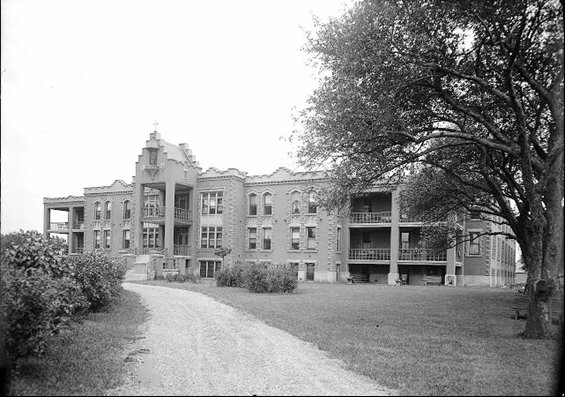 Two, Dr. Robert and Gardner, settled on the SW and SE corners of what is now the corner of Lake Avenue and Driving Park, while William ran the North American Hotel on the NW corner of Lake Avenue and Brown Street. An 1826 map of McCrackenville from a glass plate negative in the Municipal Archives is below. The N - S road in the middle of the map is Broadway, now Lake Avenue. 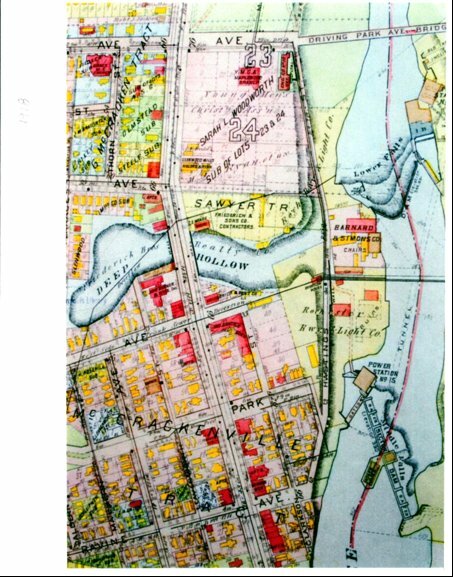 The map shows a residential section on both sides of Broadway and an industrial section on the Genesee River between the Middle and Lower Falls. South of the Middle Falls is the water level bridge built by Carthage after their high bridge collapsed. The stream on the west and north of the settlement is Deep Hollow Creek. 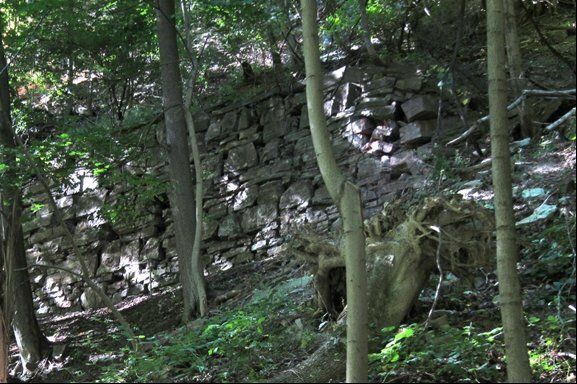 The Deep Hollow was a ravine running through northwest Rochester. 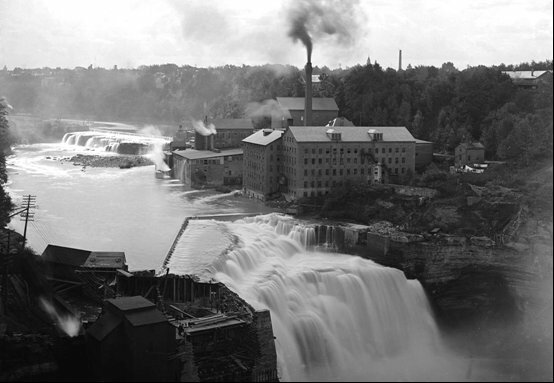 It entered the Genesee River near the lower falls. Information about the industrial section is given in the Thomas X. Grasso article referenced at the beginning of this piece. When the Xerox Tower was built, the dirt dug up was placed atop the McCrackenville ruins. The area was eventually landscaped and is now Lower Falls Park. 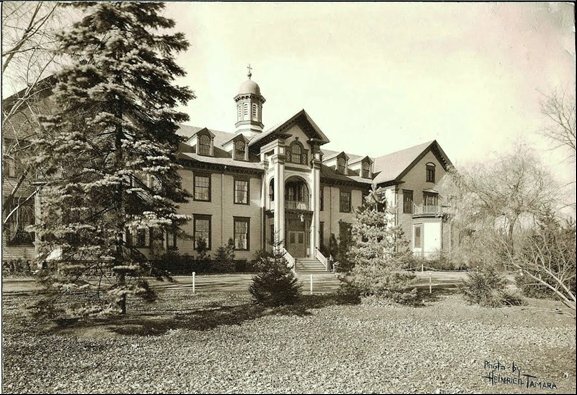 Not much has been written about McCrackenville but a local resident took two classes at the University of Rochester and wrote two papers which are linked below. The site that was McCrackenville is now Lower Falls Park with views of both falls. After several failed attempts to bridge the Lower Falls, a reliable bridge was built in 1890. It lasted nearly 100 years being replaced in 1988. An article on the rochestersubway.com site has pictures and a video showing the explosive removal of the 1890 bridge.